Genetics improvements for Jerseys in the national dairy herd and enhanced opportunities for Jersey farmers. Publicised herd recognitions for top producing farms. What we can do for you as a farmer? 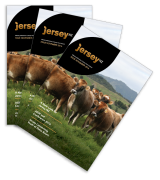 Jersey Marketing Service Ltd (JMS) can source cattle for you or sell your surplus. Listings on the Jersey New Zealand website are free. JMS hold auctions and maximises potential returns from all markets. Jersey Future – LIC. to jointly select and prove the genetic merit of top young Jersey bulls to lift the rate of genetic and productive gain of the breed. Member only offers. Jersey Genome – CRV Ambreed. To identify potential bull mothers for Jersey. Available to members with registered cattle. Below are three membership options to choose from. Any person (aged 18 years or over), partnership, company or other corporate body (one vote per membership). Any person, partnership, company or other body corporate owning less than ten registered animals, or any interested person not actively engaged in breeding Jersey cattle may become an Associate member. An Associate Member does not have any voting rights nor can they hold any elected office of Jersey New Zealand. Any person aged from five years and under 18 years. A Junior Member is not entitled to exercise any vote at any meeting of Jersey New Zealand nor is the member eligible to hold any elected office of Jersey New Zealand. On the 1st April next following the Member’s 18th birthday, the membership status will automatically become that of an Associate or Senior Member (dependent on the number of registered animals). Any member who has retired from farming Jersey cattle, not requiring to register animals but who wish to retain an active interest in the breed. There are no voting rights nor eligibility to hold any elected office of the Association. By permission of the Chairperson of any meeting the voice may be heard. Retired members shall be entitled to receive the official publication of the New Zealand Jersey Cattle Breeders Association. Annual membership subscriptions will fall due on 1st April in each year. The subscription will cover the year from 1st April to 31 March. There is a one-off fee of $5.00 + GST to apply when registering a herd prefix. Once registered you will have exclusive use of the prefix when registering cattle into the New Zealand Jersey Herd Book. Section B Registration of an Exclusive Prefix I wish to register a Prefix and submit below a list of selected names, in order of preference. Any person aged from five years and under 18 years. A Junior member is not entitled to exercise any vote at any meeting of Jersey New Zealand nor is the member eligible to hold any elected office of Jersey New Zealand. On the 1st of April next following the member’s 18th birthday, the membership status will automatically become that of an Associate or Senior member (dependent on the number of registered animals). There is a one‐off fee of $5.00 plus GST to apply for a herd prefix.